Baby’s development is affected significantly due to permanent hearing loss. Early detection of hearing loss in a newborn can help these babies to develop language, speech and communication skills. Infections such as Cytomegalovirus, syphilis, herpes or toxoplasmosis. 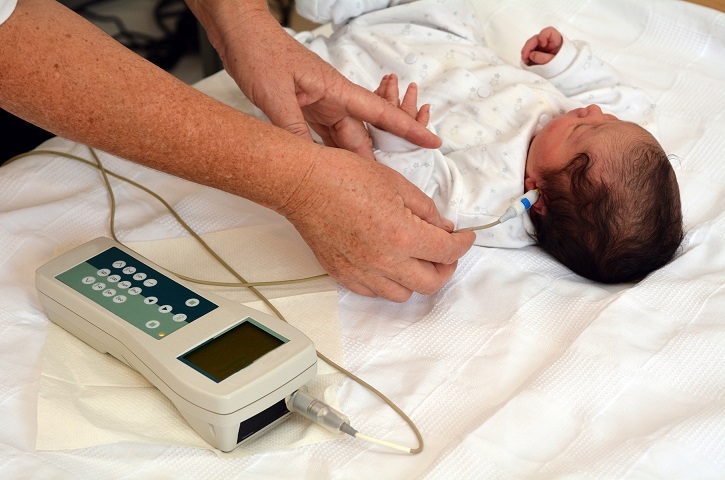 There are two different methods to test hearing loss in infants, and they are the automated auditory brainstem response (AABR) evaluations and the automated otoacoustic emission (AOAE) measures. AABR Test: Another hearing test, AABR test is also conducted to detect hearing loss in newborn. Three small sensors are placed on the baby’s head and neck. Now soft headphones are kept over baby’s ears, and gentle clicking sounds are played. Duration of this test is between 5 to 15 minutes. These hearing tests are not harmful to the newborn babies. AOAE and AABR tests are accurate, noninvasive, automated and it is not necessary to receive any observable response from the infant during these tests. The AOAE test is easy and costs effective compared to ABAR test. The result of the hearing test is given immediately after the test. These screening tests do not pick up all types of permanent hearing loss. Sometimes children develop permanent hearing loss later. Hence it is important to monitor child’s hearing once they grow up.